Sharon's Tatted Lace: Have you ever? In this long saga of working with multiple colours and multiple shuttles, I have run into yet another snag. I'm an experienced tatter and having to un-tat is just a part of tatting. Unfixable problems get cut off and really horrible disasters just get pitched in the garbage. After fighting with the screws, bits, pieces and horrible tension of working with double bobbins I resorted to using 4 shuttles. Unwieldy, but doable. Then on joining the 10th ring, while fighting with all 4 shuttles and hiding the alternate colour, the thread split and frayed. There's no help for it the last ring had to be cut. This is one of the rings in which the alternate colour has been hidden, so it's carefully undoing each stitch of the split ring and unwinding it from around the hidden thread. 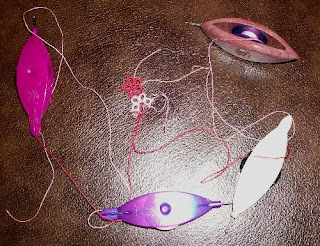 Now since my CTM thread has been cut in the middle and it means hiding 6 threads - the two cut ends - the two new ends and the two alternate colours, I can either bite the bullet and fuss with it, salvaging the thread, or I can pull the thread off the shuttles, scrap it, and start again. Have you ever run into a project where every solution seems to bring out more problems? I'm dreading hiding the cut end of the old thread and the alternate colour on the split side of the ring. I hate wasting thread. I hate having to fuss with a "relaxing" pastime. Which will win out? Oh dear me. Could be time to take a break and come back to it afresh? I agree with Jane break time, cup of coffee, feet up and relax. Then come back after a few choice words have been let rip. I usually knot the "ctm" threads together, then I wind a goodly length of thread off one shuttle, then wind that same thread back onto the other shuttle (along with that pesky knot). I now have a continuously wound pair of bobbins. I have now diverted one pair of ends from needing to be dealt with until later in the work.